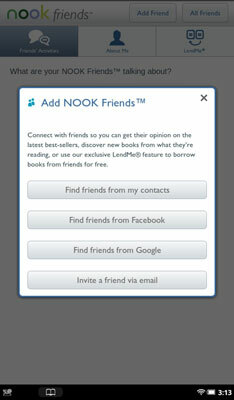 Once you have your NOOK Friends network established, you can reach out and ask someone to lend you a book to your NOOK Tablet from their Library. 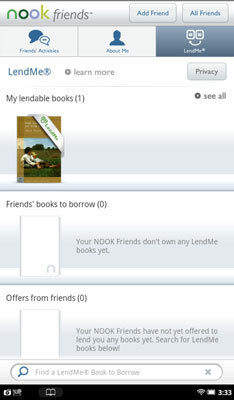 To find out who has lendable books, launch the LendMe application. My Lendable Books. Books of yours that you can loan. Friends’ Books to Borrow. All the libraries combined of friends who have posted books for loan. Offers from Friends. Specific offers from friends who are suggesting you borrow one of their titles. Tap the Borrow button next to the name of the book you want to read.